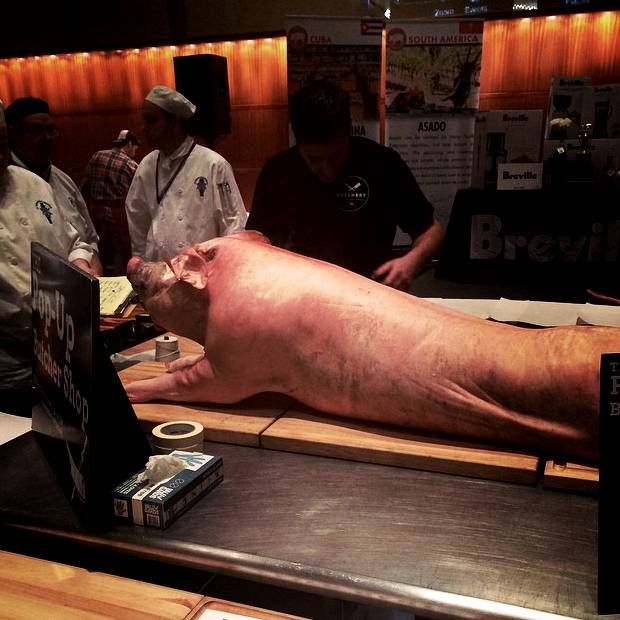 Through a colleague at Goose Island, we were fortunate enough to attend Cochon555 in St. Louis this year. Cochon was an incredible collision of the pig roasts I experienced growing up in Hope, NJ and some of the technical, high end cooking techniques I've been exploring in my adult life. I closed my eyes when I walked through the doors into the event and inhaled deeply. The smells of smoky, charred pork led my mind to the conclusion that I was outside, turning a spit to rotate a hog over a mound of ashy charcoal in a grill in the back yard. I opened my eyes to reveal, instead, a ballroom bustling with chefs, brewers, judges, and common folk in jeans like me there to take it all in. 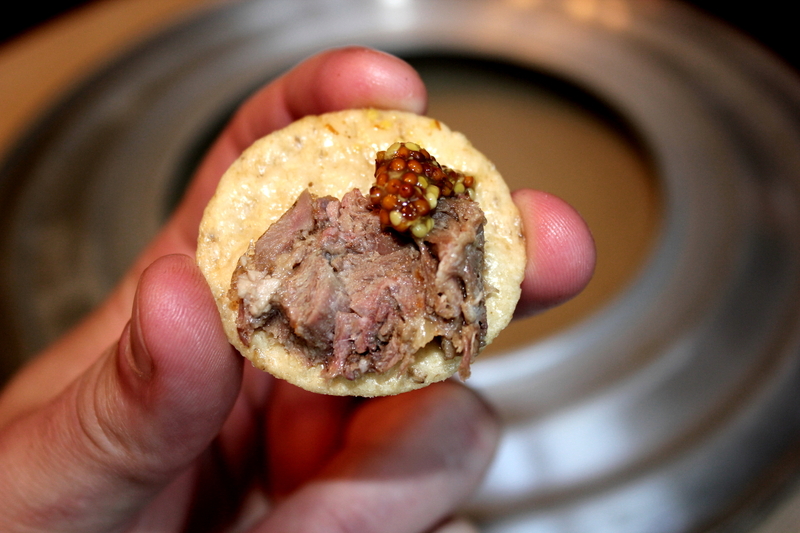 The plates of food were varied and delicious - from pork belly tacos topped with chicharron to home-cured charcuterie. Though it was an area at the center of the room that caught our eye. Sprawled out on a table was a full heritage hog with a sign reading "Pop Up Butcher Shop" (see above). The table was surrounded by CIA students ready to go to work when the time was right. They interrupted the event about half way through to announce that the pop up butchering was about to commence. The format was simple: as a cut of pork came off of the hog, it was placed on the table along with a price tag. The first of the crowd to shove cash in the money-man's hands for an item got it. Katie and I had our eyes out for the best cuts - the cheeks didn't even hit the table before someone had managed to pay for those. I landed a fattier than usual jowl (guanciale) and "secreto" which I had to look up later but it looked like a nice cut (give it a Google, it's pretty interesting). One of the girls with our group said to me "You've gotta buy the head, right?" So here is my first shot at head cheese - which is not cheese at all but a delicious combination of tender pork and reduced pork stock. It is a bit laborious to create but it feels as if I have discovered a lost art, a craft I hope to improve with time. Hopefully you can enjoy the recipe and the video - which is intentionally a bit creepy - just in time for Halloween! 1. In a stock pot large enough to fit your hog's head, sautee onions, carrot, and smoked chili powder in olive oil on medium high heat until onions begin to brown on the edges. 2. Add Pig's head, pickle juice, and enough water to fill to about 4 inches below the top of the pot. 3. Add Garlic, salt, black pepper and oregano. Cover loosely with foil. Turn heat all the way up, keep an eye on it to make sure you do not boil over. 4. Once a boil is achieved, reduce heat to medium to maintain a steady boil. Boil for 5-7 hours or until all meat has fallen off of the bone and meat is cooked. You should add water and rotate pig head as needed to ensure most of meat is covered throughout the process. 5. Remove skull from pot. Strain meat from the liquid - retaining both liquid and the meat. Return liquid to high heat and boil uncovered. Reduce until about a quarter of its volume is all that remains. 6. Meanwhile, pick out as many of the best, biggest chunks of meat from what you strained out of the liquid and place in a bowl. Taste a piece and season with more salt and pepper if preferred. Add sage and lemon juice, mix to distribute evenly. 7. 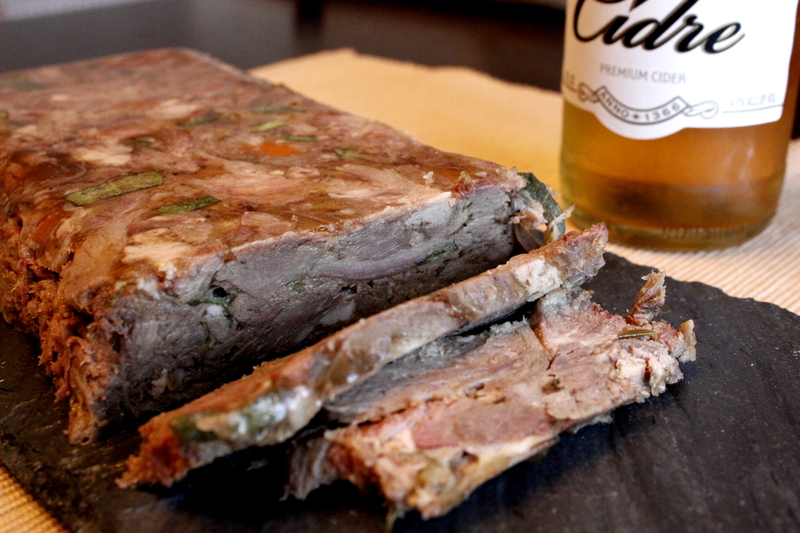 Press meat into loaf pan or terrine. Ladle reduced stock over meat, pressing down with ladle to ensure the liquid gets throughout the whole pan and all the way to the bottom. 8. Press plastic wrap down onto top of meat, refrigerate overnight, turn out the next day and serve immediately, with a cracker, mustard or horseradish, and a nice dry cider like Stella Artois Cidre.